MDR & MB tackled the walk from Charlotte Pass to Blue Lake today. This is a 10km round trip (across the Snowy River), with most of the first leg uphill so it was quite a workout. This trail was much quieter than the Mt Kosciuzko one which we walked last week. We were better organised this time, took some lunch with us and stopped at the lake for lunch, the views were awesome, there were even small patches of snow visible. 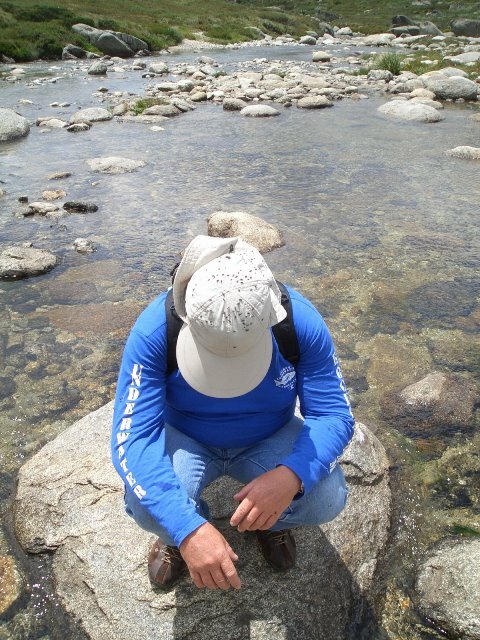 Pictured is Marc at the Snowy River collecting flies with his cap.